I have been GnuCash to help manage my finances for a while now. If used correctly, it is useful tool for tracking your finances and planning for those big ticket purchases. You do not require a lot of knowledge of accounting to use this software – just enough discipline to keep the data up to date! It is also an open source software. This tutorial provide a quick introduction to some of its basic functions. All assets, expenses, etc. are organised into a hierarchy of accounts. When you create a new file for the first time, you can use a wizard to set up some default accounts and custom them later. To begin, create your first accounts by selecting File → New → New File. A New Account Heirarchy Setup druid (or a wizard) will guide you through to setting up the first set of accounts. Feel free to go through the druid to setup the first accounts. Once the wizard finishes, you’ll be brought to the accounts page. Here, you should review which accounts have been setup, as the hierarchy of accounts also represents the breakdown of your asserts, income, expenses, etc. You should check that the accounts are broken down to a level that you are happy with. For example, if you have multiple savings account you may wish to have separate subaccounts for each one instead of having just one account to represent all of them. When you create a new account, the dialog will have an Opening Balance tab for you to enter the opening amount. The transfer column is the account that the amount is taken from. All transactions must result in a transfer to or from another account. If you leave the column blank, GnuCash will assign a default account. For opening balances, GnuCash would have suggested using a separate equity account. After entering your opening balance, you can open the account that you transferred from. You should be able to find a corresponding entry back to your account. Each time you enter a transaction into an account, there will always be a corresponding entry in the account that you transfer from or to. When you return to the main account page, the amounts in each account will be updated to account for the transactions. The totals under each account reveal how much is in an account or how much has been spent, etc. GnuCash allows can automatically enter recurring transactions. There are a couple of ways to setup the transactions. The scheduled transactions editor accessed through Actions → Scheduled Transactions → Scheduled Transaction Editor. You should be able to go through each of the options and fill in the fields without much trouble. Once you have created your scheduled transaction, it should be added to the list of transactions on the Scheduled Transactions page. You can also create scheduled transactions from an accounts page by right clicking when you are entering a new transaction. The data collected by GnuCash can be displayed in many different ways. Firstly, there is the main accounts page that provides a snapshot of how much is in each account or how much you have spent in each category. Expense Piechart and Expense Barchart reports available under Income and Expenses are especially useful if you are trying to find ways at reducing spending. If you are also wondering how much you are worth over a period of time, you should check out the Net Work Barchart under Assests & Liabilities. However, it is important to note that the reliability of the information provided by these reports depends on how well you manage to keep the data up to date. This covers the some of the features that you would most likely use in managing your personal finances. However, there are many more features not yet covered. If you run a business, it also has features for employee salaries, invoices and bills. If you hold shares, it also has features for entering purchased stocks and retrieving the latest prices. There are simply too many features to cover in this tutorial! If you are interested in using the other functions, the Tutorial and Concepts Guide under Help will provide most of the information that you require. Generating random characters in C.
23 // a lower case letter. 27 // it to a char type. The difference between the two methods is that if the MAX_RAND was less than 26, the maximum number generated using the modulus operator will be, at most, MAX_RAND whereas the numbers will be more distributed using the first technique – although you still would not be able to get all possible numbers (thanks to Riccardo for the correction!). Note that at line 13, the call to srand() provides a seed for the call to rand() later. If this seed was not provided, then the exact same sequence would be generated everytime. Also, if you also compile and run the example enough times, you should notice that the exact same sequence will appear after a number of tries. This is because rand is a pseudo random number generator (PRNG – see this wiki page for a detailed description). 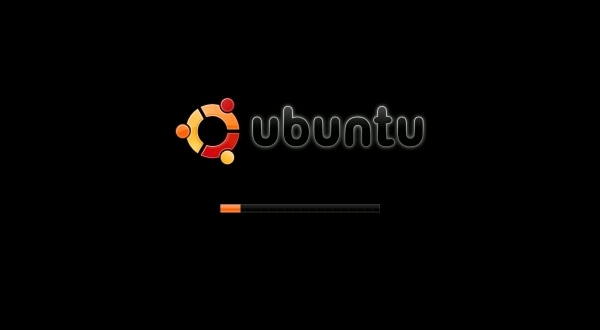 To change boot screens easily in Ubuntu, you need to first install the StartUp-Manager. This can be easily done by going to System -> Administration -> Synaptic Package Manager. In the manager, search for “startupmanager” (yes, one word). Right click on the start manager and select “mark for installation” and click on apply (the apply option becomes enabled once you have marked the start up manager for installation. 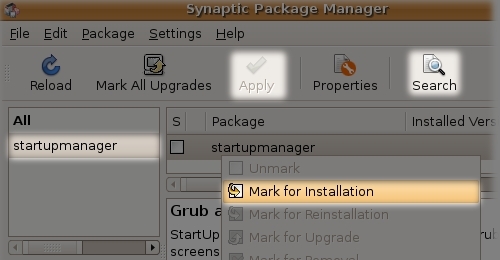 Installing the start up manager using the Synaptic package manager. Once the manager is installed, you can access the startup manager by the menu System -> Administration -> StartUp-Manager.Now, go to the Appearance tab and you should see the options for changing the Usplash theme at the bottom. Choose the theme you want to use. 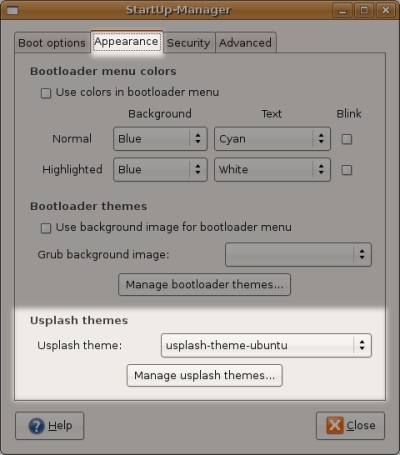 The next time Ubuntu boots up, you should see the new theme that you have selected. If you are like me, you like to play games in Windows, but like to do some programming using Linux. Its pain rebooting the computer just to switch between the operating systems. Virtualization lets you use one operating system inside another. However, mention the two words and most people would probably only think of VMWare. I too used to use VMWare. However, VMPlayer doesn’t let you create your own virtual machine – you have to get an image from another source. For this reason, I went looking for an open source virtualisation software and I came across Virtual Box. I now use it run the Ubuntu 8.04. It didn’t take long to get used to the Virtual Box way of things. The only thing that really took a while for me to figure out how to get the guest operating system to truly occupy the fullscreen. It turned out to be something as simple as installing the guest add-ons. If you have been using VMWare, this one extra step to take and one that required me to read the manual. Performance wise, it runs well on my quadcore machine with Windows XP as the host operating system, although the only thing I use it for is doing some development work in Linux. More importantly, Virtual Box allows you to create and customise your own virtual machine without having to buy a license.